I must admit the more I see of these UN Marine Chronometers, the more I am starting to like them. Maybe that’s because I’m (cough, cough) getting a bit older or maybe I’ve been charmed by the simplicity of these watches. 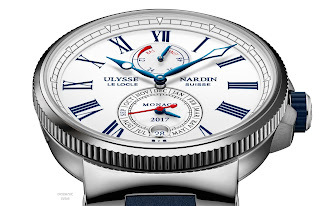 What’s not to like a about a nautical watch with a huge highly polished fluted-bezel, blued hands and markers, high-grade Stainless steel, swathes of blue rubber and touches of Titanium. I might have to get some tissues! 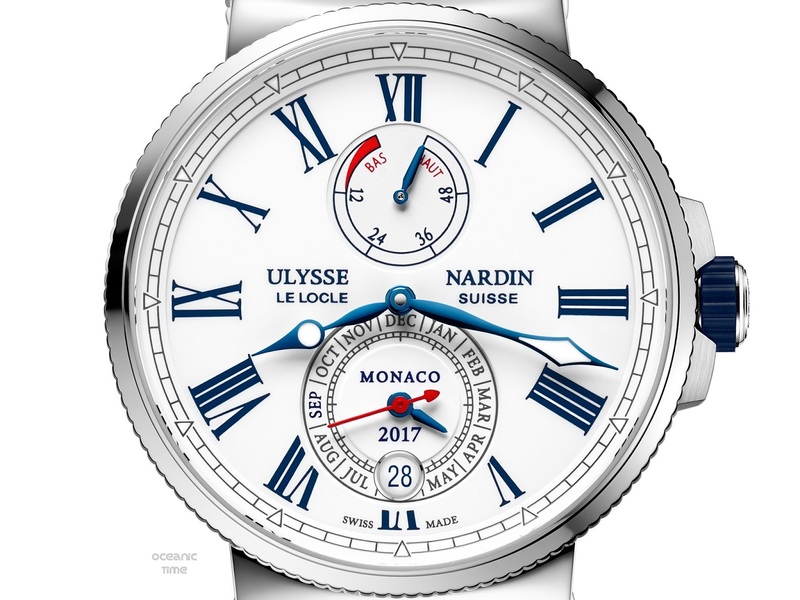 In case you missed the heading, this is the 100 piece Limited Edition Marine Chronmeter Annual Calendar Monaco produced by Ulysse Nardin in celebration of 9 years of loyal support for the prestigious Monaco Yacht Show. Wait, so this is the 9th anniversary model, I wonder what 10 years is gonna look like?! UN watches have what the brand describe as seafaring DNA and I couldn’t agree more – few brands have the maritime heritage or impeccable pedigree that they do. 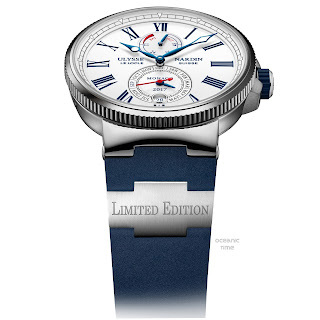 It isn’t a diver but it is a stunning watch that is so evocative of the ocean, and it comes with a pretty special in-house compilation to boot. Mechanical annual calendars usually requires up to thirty components. 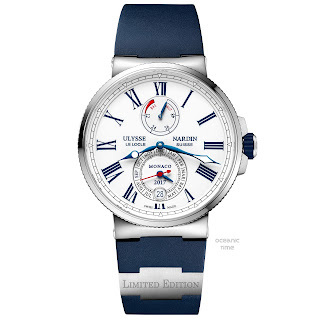 However in their quest for simplicity, UN’s watchmakers have managed to scale this down to a mere 7 elements. It enables the calendar date-setting both forwards and backwards – yet another simplification. It requires a date adjustment only once a year. The UN-113 caliber powering the watch has a Silicium escapement and balance-spring – made entirely in-house at the UN workshop. A celebration of the Monaco Yacht Show is displayed in several details on the white lacquered dial with its distinctive blue Roman numerals, UN a signature feature for their Marine collection. 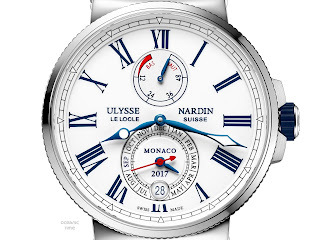 A stunning tribute to the event of the year comes in the form of Monaco 2017 inscribed on the dial. The dates of the event (27, 28, 29, and 30) and the month of September are highlighted in blue, instead of black, on the date disc. Finally, the Marine Chronometer Annual Calendar Monaco is water-resistant to 100m, its 43mm Stainless-steel case is equipped with a fluted bezel and a rubberized screw-down safety crown. An anti-reflective Sapphire crystal reveals the UN-113 caliber in the open caseback, and a rubber strap with a folding clasp and Titanium element keeps it firmly planted on the wrist. Its MSRP is €9900 / CHF 9900CHF.